TORONTO, ON – Import and sales agency North American Craft has announced the release of a new own brand beer. Bright, light, and crisp. The citrus hops flavors pop up front, with light lemon, grapefruit, followed by subtle tropical fruit. Mild malt sweetness quickly drops off to a nice back-end bitterness — it’s very clean and showcases the hops well. Well- balanced for the style, hops-forward, with just enough sweetness from the malt that gives way to a fruity hops profile that dominates through the finish. 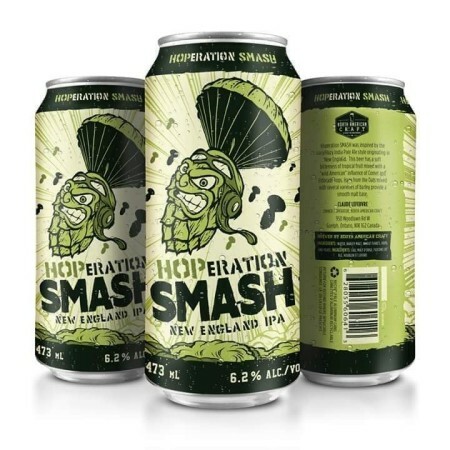 Hoperation SMASH is being officially released this week in Ontario, where it will be available in 473 ml cans at select LCBO and grocery store locations, as well as self-serve Beer Stores.